Media rights organizations are calling on authorities in Cameroon to release five journalists detained without charges in the past month after reporting on the country’s unrest. 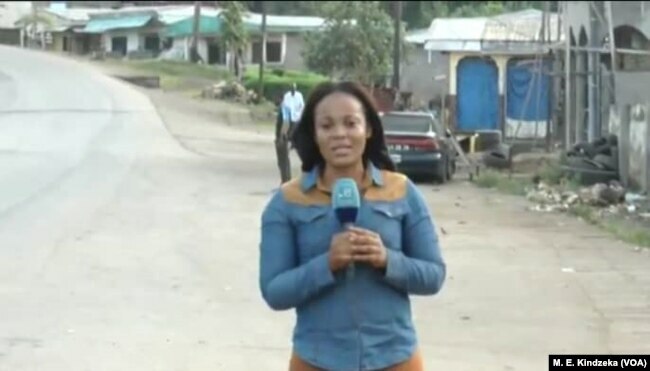 TV host Mimi Mefo is the latest journalist believed to be targeted by Cameroon authorities for her critical reporting. A Cameroonian gendarme summoned popular TV host Mimi Mefo, who heads English news for privately-owned Equinoxe broadcasting. Mimi Mefo on the field in Mbengwi, North West region in Aug. 2018. Mefo was called Monday to appear before the military legal body after several threats were made on her life. But Mefo believes authorities are trying to intimidate her because of her reporting. “I contacted my lawyer, barrister Tamfu Richard, who told me that an investigation has been opened against me on propagation of false information and cyber criminality. The problem here actually are my reports, my debates, my social media reports and my day to day, minute by minute updates on my website and social media on political and social issues in Cameroon. When you report the atrocities, you are threatened and considered as an enemy,” said Mefo. Media rights groups say Cameroon authorities have targeted several journalists for critical and detailed reporting on the country’s insurgencies. Cameroon police detained journalist Michel Biem Tong on October 23. Tong is known for critical reporting of the military’s atrocities in the fight against Boko Haram terrorists in the north and Anglophone separatists in the west. Publisher Gustave Flaubert Kengne, whose publication Orientation Hebdo specializes in human rights reporting, was among those detained in October. While Cameroon authorities accused the reporters of “propagating false information,” none of them have been officially charged. Cameroon Communication Minister Issa Tchiroma says everyone should stop publishing information that jeopardizes Cameroon’s unity. “As far as the fight, the battle against the terrorism is concerned, whoever respects the law will be at peace in our nation. What is unacceptable is the fact that the journalists would lie [to] the international community to exert influence on President Biya to get the journalist released,” said Tchiroma. The Union of Cameroon Journalists is calling for authorities to immediately release the reporters. Union President Charlie Ndi Chia says the government is persecuting journalists. The Committee to Protect Journalists has criticized the attacks and also asked charges against the journalists to be dropped for those detained to regain freedom. CPJ says since 2016 Cameroon has repeatedly jailed journalists for reporting on unrest in the western regions of the country. Reporters Without Borders 2018 World Press Freedom Index ranks Cameroon 129 out of 180 countries in the world.